I deleted quite a few reminders on my iPhone 6s by mistake. Since I have updated iCloud backup and also backup to my MBP, I figured I would just restore from my last backup. However after the restore was complete, the deleted reminders doesn’t appear as they supposed to be. Is there any other way to get my Reminders back? Reminders and calendars on iPhone are expected to remind people of important upcoming events, missing which will possibly mess one’s work or life. However, accidents always happen, and people would be panicky when reminders are lost. Don’t worry. 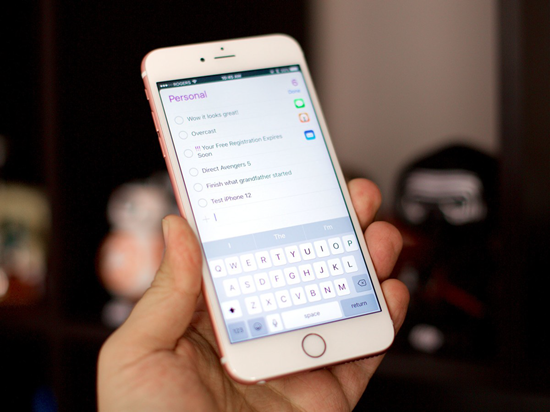 Here are some methods for you to recover reminders and calendars from iPhone/iPad/iPod touch for free. Along with the release of new iOS versions and iPhone models, Apple keeps updating iCloud functions. Now besides iPhone backup, you can sync your reminders and calendars to iCloud immediately by activating “Reminder” and “Calendar” in iCloud settings. Due to these features, once you’ve turned them on, your reminders and calendars won’t be in iCloud backup, but there is a new way to restore them if you lost them. Go to iCloud.com on computer and sign in with your Apple ID. 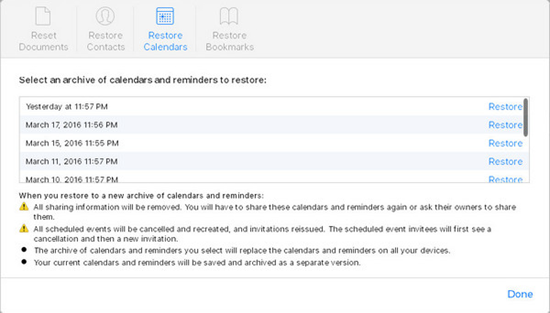 Click into Settings icon, Scroll down to Advanced, and tap on “Restore Calendars and Reminders”. Then a small window will pop up and show a list of the restorable files, click on “Restore” on the latest one. It then will remind you that all reminders and calendars currently on your iPhone will be cleared up to restore, confirm it to continue. It might be the most simple way to recover your lost reminders and calendars. But if you see “No archives available”, that means somehow the synchronization between your iPhone and iCloud was failed so there’s no record file, and you’d better jump to the next method. Gihosoft iPhone Data Recovery is a professional free recovery software for iOS users to retrieve deleted reminders and calendars from iPhone/iPad/iPod touch. It perfectly supports the latest iPhone X, iPhone 8/8 Plus, iPhone 7/7 Plus, SE, 6S/6S Plus, 6/6 Plus, iPad Pro, iPad Air 2, iPad mini 4/2, and more, along with the latest iOS version. Different from iTunes, this iPhone recovery software can also scan backup data from iTunes and iCloud, and provides complete preview after scanning to let you do selective recovery instead of direct restoring. With this software, you can freely and selectively recover reminders, calendars and other data to computer in multiple readable formats for printing or other actions, no matter you have backup or not. The program can help you recover reminders from iOS devices directly. The whole recovery procedure can be done within three steps. Run iPhone Reminder Recovery on PC, ONLY select “Reminders” and “Calendars” items. Connect iDevice to computer and click next to scan. Preview recoverable data and “Recover” them to computer. Note: Apart from reminders and calendars, this iPhone Recovery freeware is also capable of recovering deleted iPhone notes, Safari bookmarks, voice memos, voicemails, contacts, text messages, WhatsApp, Viber, photos, videos, and more. Beside iOS devices, Gihosoft iPhone Data Recovery is able to recover lost reminders and calendars from iPhone backups as well. If you want to restore reminders only but not the whole iPhone from backup. 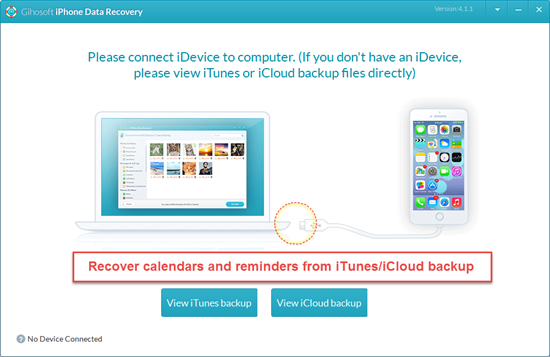 Or you are not quite sure that the backup contains what you need, you can use the iPhone Data Recovery software to extract reminders and calenders from backup for free. And this method works even if you have your iOS devices lost or broken. Step 1: Run the iPhone Calendar Recovery software on PC, and ONLY select related items then click Next. Step 2: Don’t plug in your iDevice. Choose “iTunes Backup” or “iCloud Backup” accordingly. 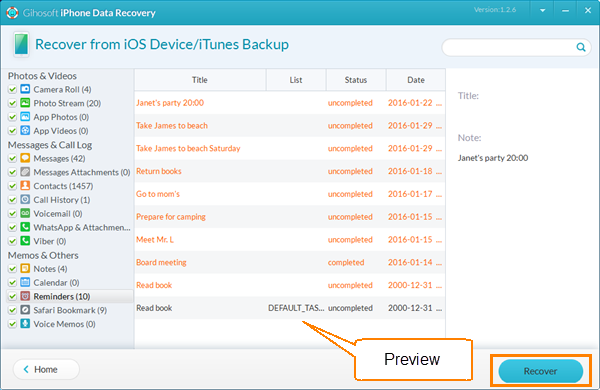 Step 4: Preview the recoverable data and extract them from backup selectively. Also, you can use this software to check your backup content and then restore your iPhone with iTunes or iCloud. However, restoring data from iTunes/iCloud backup will erase all the existing data on your iPhone and replace them with the old ones, which may make the problem worse. If you have some data on iPhone that haven’t been backed up to either iTunes or iCloud yet, it is not worth the risk. If you have any question or suggestion, welcome to leave a messages in the comments below.